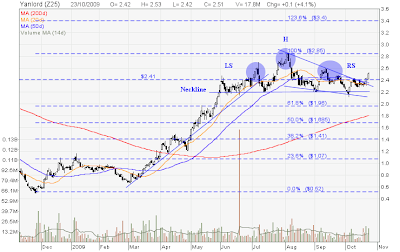 Yanlord – Head & Shoulders Pattern Failure! Yanlord appears to have Head & Shoulders pattern failure and breakout from the falling wedge. When there is a pattern failure, the reverse will happen. Current price is above 20D, 50D and 200D MA. My plan is to go long when Yanlord retest $ 2.41 support level and bounces up. Exit Target = $ 2.85. China Fishery – Dropped out from the up trend channel! Allgreen – Forming a Right Shoulder?